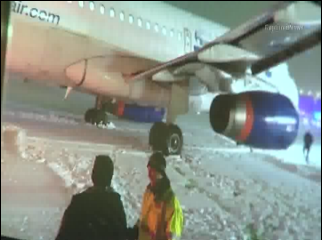 The plane was set to depart and taxiing to the departure runway when a wheel slid off the tarmac into snow, according to Chicago Fire Media Affairs. Passengers deplaned and were transported to a terminal by buses provided by the Chicago Department of Aviation. No injuries were reported. All passengers deplaned using airstairs and were taken back to the terminal. The taxiway was closed and three flights behind the aircraft were temporarily impacted, officials said.